Final Modern Language Exams – What real speaking goal? After I gave a recent presentation, a teacher talked to me about her June final which the department chair made up. This teacher stressed that she believes in communication and she wants to prepare her students to communicate with people from the target language. However, the department final has a speaking component in which students wrote out a conversation, memorized the conversation, and said the memorized lines. She remembers that last year during the final speaking her students made comments to their partners such as “I can’t remember what we wrote,” “Say your lines,” and “What comes next?” All those comments reinforced that the final was not a speaking final but a recital or saying of memorized lines. It had nothing to do with the give and take of a real life conversation. She remembers that no student displayed any emotion while speaking except for stress and frustration during the conversation even though they said happy lines (I really like to …) and sad lines (I am sorry). They mechanically delivered their memorized conversation. One of many possibilities is to move to final like a modified OPI in which someone asks students some general questions and some probing questions. Another possibility is for two students to spontaneously talk about a previously unknown topic or situation. What does your speaking final show about your real goals for your students speaking in a world language? http://bit.ly/mlcomcult has many activities that allow students to interact in the language. 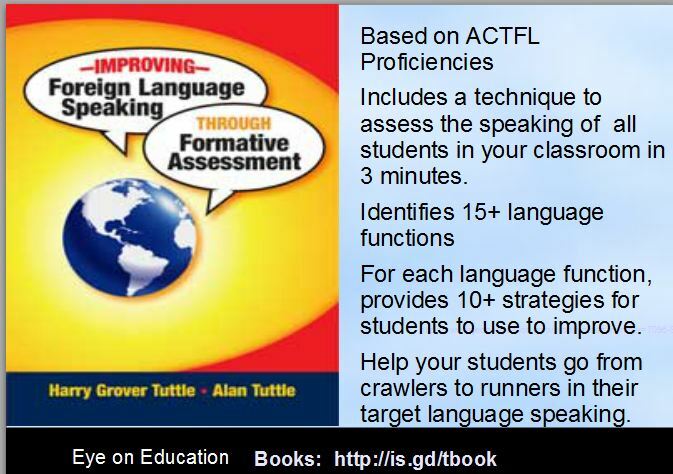 At http://bit.ly/tuttlebks, I have a book, Improving Foreign Language Speaking Through Formative Assessment. I have talked with many modern language teachers about their final and, specifically, about the speaking part of the final. They all agree that speaking is important and that speaking needs to be tested. Sometimes, they give the students a few possible topics, give them a week or a few days to prepare, then, in class, the teacher picks one of the topics for the students to talk about. The students think about the topic, write out the sentences, memorize the sentences and recite the sentences during the speaking final. However, this type of speaking final contradicts actual speaking. Since during the speaking final, the students recite what they have previously written, the exercise is really a writing exercise. Secondly, in no normal target language conversation, does someone walk up to a person, say give me a topic, and, then, return the next week to talk about that topic. In a real conversation when the conversation turns to a new topic, the people begin to instantly speak about it. There is no time delay in talking about a new topic. Thirdly, this type of speaking resembles presentational speaking and not interpersonal speaking. The students just recite their sentences, they do not really interact with the other student. Usually their conversation becomes a memorized dialogue. They do not show language fluency but they do show the ability to memorize. – Have students speak spontaneously about a topic. They may have a list of 30 topics such as restaurant or 30 situations such as problems in the classroom but they do not know which topic they will have. Students can practice talking about any topic by asking and answering questions about any topic. – Have students talk based on a picture. They do not describe the picture but use it as a context for their speaking. For example, they see a picture of a soccer game and pretend to be a player in the game. Or one student interviews another student who knows about the situation. Let’s make speaking assessments include the speaking for the final to be ones in which students speak spontaneously to more closely represent real-life speaking. My Spanish spontaneous speaking activities (25+) includes Modified Speed Dating (Students ask partner a question from a card-whole class), Structured Speaking (Students substitute in or select words to communicate in pairs), Role Playing (Students talk as people in pictures or drawings from 2-4 people), Speaking Mats (Can talk using a wide variety of nouns, verbs and adjectives to express their ideas- pairs or small group), Spontaneous Speaking (based on visuals or topics in pairs), and Grammar speaking games (pairs or small group). Available for a nominal fee at Teacherspayteachers: http://bit.ly/tpthtuttle. I have a series of modern language visual stories (the beach, the city, school, etc.) for two students to role play; the restaurant role play involves four students. Can use in any language since there are just visuals, no words.